Merry Christmas to everyone !!!!!!!!!!!! Time passed without waiting, each day by day. In just a couple of days away, Christmas is up again when everyone is once again busy with all the preparations. Turkeys are been slaughtered for our tables, while families return from afar to reunite. Children too, will be gleaming with joy as they greet their presents with outstretched arms. Many will be getting soft toys (Angry Birds will be top on the list this year), while the richer family will get all the high-tech gadgets, such as Iphone, Ipad and Ipod etc. Yet, in some corners, there will still be poor and under-priviledged children, hungry and out in the cold. Lets not forget about them and teach our children to fork out whatever they have .... to share the warmth and love on this special occasion too. [This is cool ... it looks like the house is jumping with real joy. View in full screen by clicking the box in right bottom with red arrows of You-Tube screen. Turn up the volume (the best is towards the ending part). The Chinese race are particularly curious, in knowing what their own animal zodiac sign will bring for them in each new lunar year. 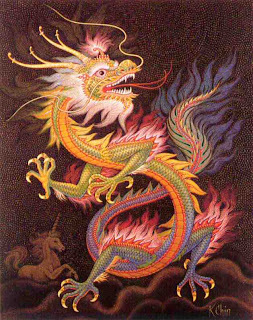 Apparently, Year 2012 will be the Year of The Dragon. This is a cultural belief which is going on for decades. For some families, especially those who are business-minded, they are even more eager to invite the arrival of new 'dragon' siblings during that year, and better still if the newly born is a boy. In every new lunar year, the Chinese also believes that each ruling animal for that year will have a governing force on certain animal, or animals. For Year 2012, those born under the 'dog' sign is said to be most badly affected and will have to be particularly watchful on their career & family life, wealth, luck and especially, their health. Believe it or not, its up to you. As for me, I prefer to avoid 'wherever' I can !!! However, for those who wishes to know at what is in store for you next year, you may refer to your own horoscopes from the above 'URL', provided. For those, who are of other races, and if you are curious too, just refer your year of birth (which will be shown below each of the 12 animals) and then, click on the animal to find out the rest. It is an endocrine gland that is located in the neck area. The main thymus gland function is to produce T-cells, also known as T-lymphocytes. The thymus gland, which is shaped like a pyramid, is a specialized organ of the human immune system. It is also one of the important glands in the human body. It is a pinkish gray colored organ that is situated in the upper thoracic region, under the sternum or the breast bone. The thymus gland is made up of two lobes, that are divided into lobules by a septum or wall. These lobules are called thymic lobules and are enclosed in a capsule. The thymus has two parts - the central medulla and the peripheral cortex. In newborn babies, this lymphoid is larger as compared to an adult. The thymus gland continues to grow till puberty and then it undergoes involution, which is a process where the thymus starts a reverse procedure and begins to shrink in size. The thymus gland in an elderly individual becomes just a bit of adipose (or fat) and connective tissues. Let's now learn about the thymus gland function. The thymus gland is very active, during the childhood years. It plays a crucial role in developing and improving a child's immunity system. The main function of the thymus gland is to produce and process lymphocytes or T-cells (where 'T' stands for thymus). Lymphocytes are white blood cells, which are also known as leukocytes. After the white blood cells mature, they leave the thymus gland and get settled in the spleen and the lymph nodes, where a fresh batch of T-cells is produced. These white blood cells are the body's immunity system and protect the body by producing antibodies that stop the invasion of foreign agents, bacteria and viruses. These cells also ensure the proper functioning of the body system and look after the wear and tear of the organs. Another function of thymus gland is to prevent the abnormal growth of cells, that may lead to cancer. The T lymphocytes travel from the bone marrow to the thymus gland where they remain till they get activated. After maturity, the lymphocytes enter the blood stream from where they travel to other lymphatic organs and provide defense mechanism against diseases. The thymus gland also produces a hormone called thymosin, which stimulates the T-cells in the other lymphatic organs to mature. This gland also produces another hormone called thymopoietin, which is protein present in the mRNA (messenger RNA) and is encoded by the TMPO gene. In some cases, the thymus gland tends to become under-active. The individual may have a weak immunity system and be prone to many infections and allergies. These infections can be chronic and may prolong for a long time. When there is a lack of T-cells in the body, it can lead to immunodeficiency diseases. The person suffering from immunodeficiency diseases may show symptoms like extreme sweating, puffiness or soreness of the throat, swelling in the glands and depression. Malnutrition and a deficiency of protein, from an early age, in the diet can lead to the slow or limited growth of the thymus, thus impairing the normal functioning of the lymphocytes. Thus ensure that your child eats a well-balanced meal and also has the right amount of essential nutrients, which can also be given in the form of supplements. During neonatal and preadolescent stages, the thymus is large and is one of the mist active glands in the human body. But as the individual grows older, the thymus gland shrinks and is replaced by the fat (or adipose) tissue. To ensure the healthy functioning of this vital gland and prevent any disorders, a routine body analysis is essential. There are two main kinds of cancer that can develop in the thymus. A thymoma is a tumor in which the cancerous cells look very similar to those of normal thymus tissue. Thymic carcinomas, on the other hand, have cells that do not resemble thymus cells. Thymic carcinomas are particularly dangerous because they grow more rapidly and are more likely to spread to other tissues. Thymomas are associated with autoimmune diseases in which the immune system attacks healthy tissue. Both thymomas and thymic carcinomas can be present without causing any symptoms. When cancer of the thymus gland does cause symptoms, it can lead to a cough and chest pain.